Image: “DSC00652” by Rick Foster is licensed under CC BY-NC 2.0. 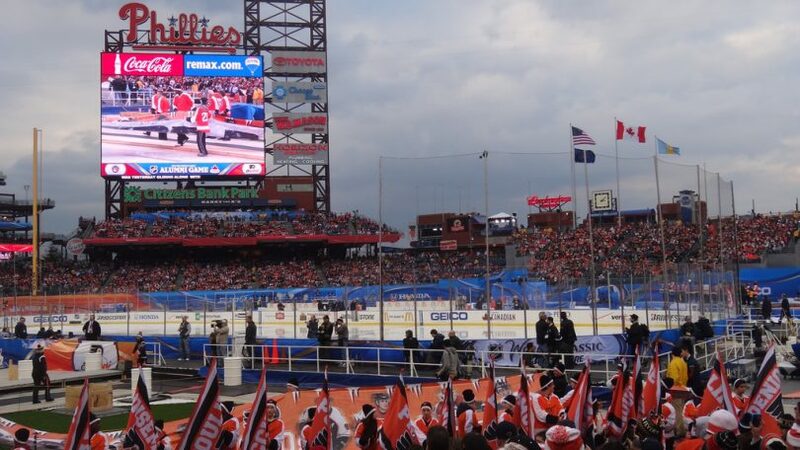 What a way to finish for those Flyers in the Stadium Series showdown with the Penguins last Saturday! The Flyers looked like they were down and out by the third period, but late goals by James Van Riemsdyk and Jakub Voracek tied the game at three — sending it to overtime where, the captain, Claude Giroux, put it away. Smull was not worried the Flyers were down by two goals in the third period because “the Flyers have always been a team that turns it on late in the game.” Many fans started to depart the stadium early to get out of the cold and rainy conditions, but missed an epic comeback victory for the Flyers. The weather was a big factor in this game with rain affecting visibility as well as the way the players and puck could move on the ice. The gameplay looked sloppy and Smull talked about how he could tell it was tough for players to make clean passes and shots since the the weather conditions “certainly did not makes things easier for either team.” The weather may not have been ideal, but the players loved every moment of last Saturday’s game. Many NHL players grew up playing on frozen lakes and ponds in their hometowns, so the opportunity to play an NHL game outside has got to be very nostalgic for them. This year’s Stadium Series turned out to be the most watched NHL regular season game — excluding the Winter Classic — in the past five years, according to an NBC press release. This doesn’t come as a surprise since both Philadelphia and Pittsburgh are big time hockey towns and Sidney Crosby is one of the most well known names in the league. The Flyers-Penguins rivalry is always a tough one, especially this year with the Flyers trying to make a late season playoff push. The Blue Jackets currently hold onto the last wildcard spot with the flyers trailing by five points. The Stadium Series also had a lot going on and off the ice, with live music during intermission and Flyers mascot Gritty up to his usual antics. Country music star Keith Urban brought the heat first intermission, rocking a t-shirt in bitter weather and playing his hits with a pyrotechnic backdrop. The Canadian rock band, ‘The Glorious Sons,” also played a pre-game show and performed a high energy set to warm the crowd up during the second intermission. Gritty had quite the entrance flying in on a zipline pumping the crowd up. Gritty also had an early exit after streaking during a stoppage of play. This of course really got the crowd riled up and created a social media buzz. Following the Stadium Series last Saturday, the Flyers defeated the Sabres 5-2 on Tuesday, lost to the Blue Jackets 3-4 Thursday in OT and finished the week off beating the Devils 6-3 on Friday. As of Friday, the Flyers currently sit five points out of the last wildcard spot in the East behind the Penguins and Blue Jackets. The last month of the regular season is upon us, so let’s see if the dominos can fall right for the Flyers. A playoff appearance is not impossible, but will probably need the Penguins and Blue Jackets to fall apart this last month. Either way the Flyers went out last week and won the one game they had circled on the calendar all season. There is no better feeling for this young Flyers team then to beat their rival in the NHL’s biggest game of the regular season.